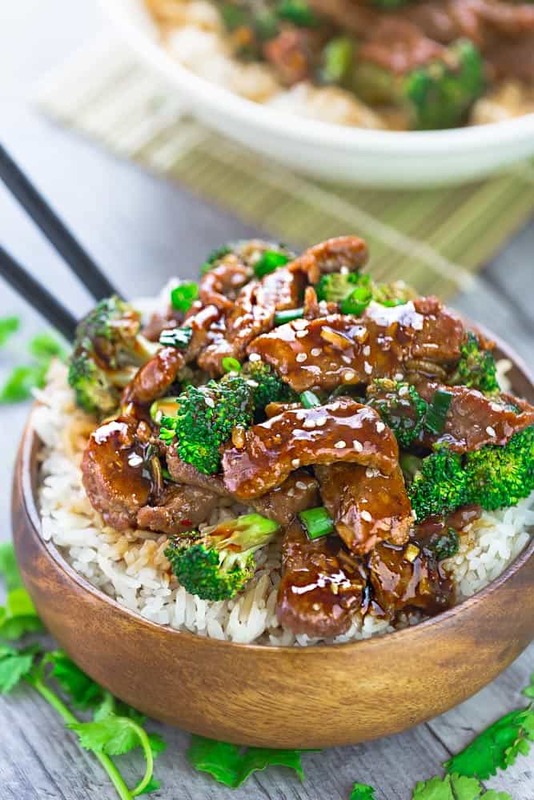 Instant Pot Beef and Broccoli – an easy Chinese takeout favorite perfect for busy weeknights. Best of all, the melt in your mouth beef cooks up in your pressure cooker and in delicious in a rich and savory sauce. Beef and Broccoli is a popular favorite around here. We usually rotate between this beef and broccoli stir-fry or slow cooker recipe and this time we’re making it in the Instant Pot. 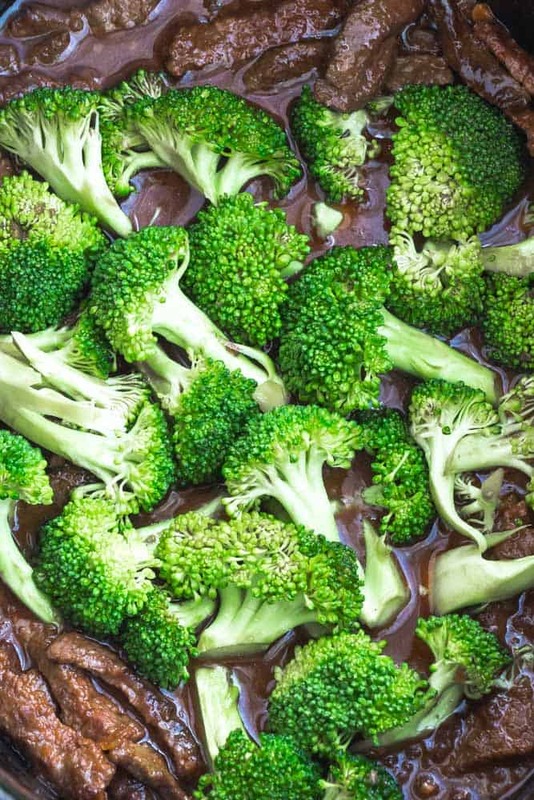 This Instant Pot Beef and Broccoli takes just a few minutes to prep and it’s much better for you than if you ordered out at the local Chinese takeout restaurant. The best part about making any copycat dish at home is how easy you can customize the ingredients. This recipe calls for slicing up some beef chuck roast but if you have flank or sirloin but feel free to use those instead. Lock on the lid and the beef pressure cooks in your Instant Pot in less than 30 minutes. And for those of you that are following a ketogenic or paleo diet, I’ve included low carb and healthier swaps so you can enjoy this Instant Pot beef and broccoli dish guilt-free. For this Instant Pot recipe, I recommend using boneless beef chuck roast. It helps to pop the beef into the freezer for about 10 minutes. This helps to slice when you’re trying to slice thin pieces. The chuck roast cooks up nice and tender. But if you can’t find chuck roast, flank steak should also work in a pinch. The delicious rich and savory sauce is made with low sodium beef broth, low sodium soy sauce, oyster sauce, garlic, ginger, sesame oil and red pepper chili flakes (optional) for a kick of heat. To keep the broccoli perfectly tender with a bit of a bite, you’re going to steam it in the microwave for about 2 minutes. Then you just stir it into the Instant Pot right at the very end. This helps helps prevent the broccoli from getting too mushy than if you were to cook it together with the meat. Once the beef is done, you turn the Instant Pot to SAUTE – stir in the cornstarch slurry and the steamed broccoli and cook until the sauce thickens up. CAN I SUBSTITUTE INGREDIENTS IF I HAVE ALLERGIES? 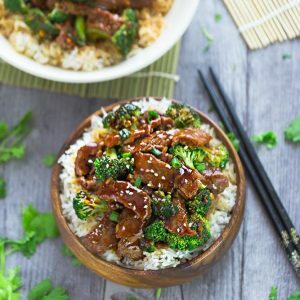 WHAT CAN I SERVE THIS INSTANT POT BEEF AND BROCCOLI WITH? 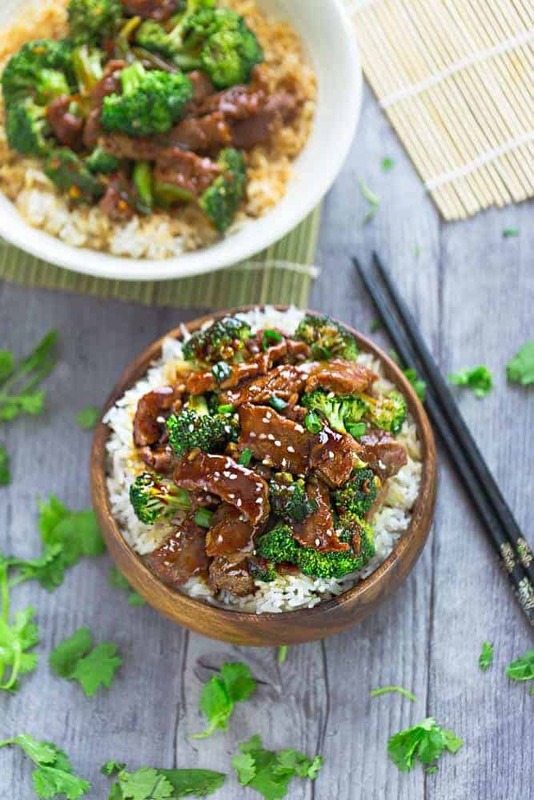 You can serve this beef and broccoli with Jasmine rice, brown rice, spiralized vegetables, zoodles, cauliflower rice or any of your favorite sides. 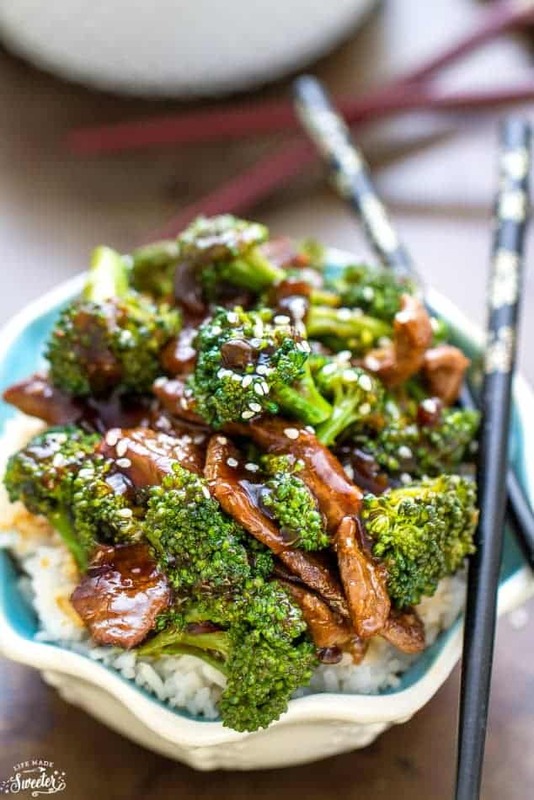 Instant Pot Beef and Broccoli - an easy Chinese takeout favorite perfect for busy weeknights. Best of all, the melt in your mouth beef cooks up in your pressure cooker and in delicious in a rich and savory sauce. Season beef with salt, pepper, and 1/2 teaspoon sesame oil. Add olive oil to the Instant Pot and press the SAUTE button. Once the Instant Pot is hot, sear the beef for 1-2 minutes until brown (cook in batches as needed) then add garlic and ginger. In a medium bowl, whisk together the beef broth, soy sauce, oyster sauce, brown sugar, 1 1/2 teaspoons sesame oil and chili flakes (if using). Pour over beef. PRESS Cancel, then press MANUAL or PRESSURE COOK on HIGH. Set to 6 minutes and cover with lid. Turn heating valve to SEAL. Meanwhile, place broccoli in a microwave-safe bowl with 1/4 cup water. Microwave 2 – 3 minutes until broccoli is tender. Quick release the pressure of the Instant Pot after the beef is cooked and there is a beeping to tell you it's done. Carefully open the lid and whisk together the cornstarch and water to create a slurry in a small bowl. Stir into the Instant Pot and press SAUTE. Add the broccoli and cook until sauce has thickened and broccoli is hot. Adjust seasonings and sprinkle with sesame seeds, green onions. Serve hot with your favorite sides - rice, noodles, zoodles, cauliflower rice or quinoa.